Endow your loved ones residing in Delhi with exciting combos. We make it easy for you to send combos to Delhi online with our diverse catalog. 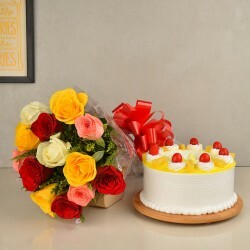 We provide you the one-stop destination for combos like cakes, flowers, chocolates, soft toys, sweets, dry fruits among many others. Enjoy free shipping of combos wrapped with love by us. Products in this category have been rated 4.6 out of 5 based on 128 reviews.